Dravet syndrome is a rare and malignant epileptic syndrome that is typically resistant to antiepileptic drugs. There is a growing interest in the antiepileptic properties of neurosteroids. Especially progesterone is known to act as an anticonvulsive agent. However, contraceptives that act as orally given neurosteroids often lead to increased seizures in women with epilepsy. We report on two girls with Dravet syndrome, who gained seizure freedom under therapy with contraceptives. The first patient received an oral contraceptive, a combination of an estrogen, and a gestagen, due to hypermenorrhea. The second received a pure gestagen implant for contraception. 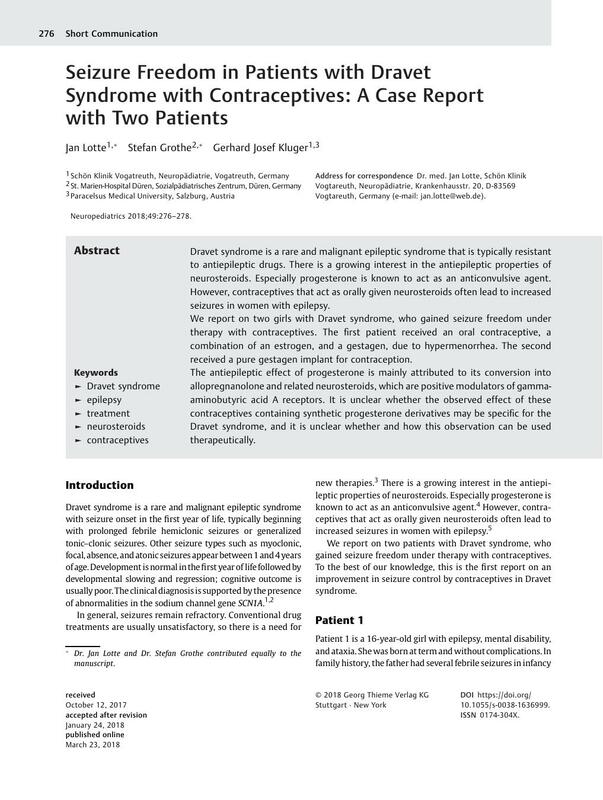 The antiepileptic effect of progesterone is mainly attributed to its conversion into allopregnanolone and related neurosteroids, which are positive modulators of gamma-aminobutyric acid A receptors. It is unclear whether the observed effect of these contraceptives containing synthetic progesterone derivatives may be specific for the Dravet syndrome, and it is unclear whether and how this observation can be used therapeutically. * Dr. Jan Lotte and Dr. Stefan Grothe contributed equally to the manuscript.